Pope St. Sixtus II was the Pope from August 257, until August 258. 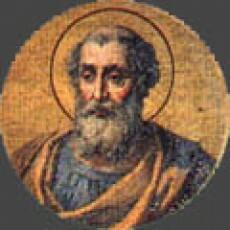 He died as a martyr during the persecution by Emperor Valerian I. He is believed to have been a Greek. In the persecutions under Valerian I in 258, numerous bishops, priests, and deacons were put to death, trying to stop Christianity from spreading. Pope Sixtus II was one of the first victims of this persecution, and was beheaded on August 6th, 258. He was murdered along with six deacons, Januarius, Vincentius, Magnus, Stephanus, Felicissimus and Agapitus. St. Sixtus II prophesied that his most well-known deacon, St. Lawrence of Rome, would suffer martyrdom three days after his master, and he was beheaded on August 10, 258 – just as Pope St. Sixtus II had prophesied. Rome does have a composition that was written by Pope St. Sixtus to this day. When you here the names of saints in the Roman Canon of the Mass, it is St. Sixtus II and his companion-martyrs that are commemorated during this prayer. Pope Damasus I, placed the following inscription honoring him, on his tomb in the catacomb of Callixtus, “At the time when the sword pierced the bowels of the Mother, I, buried here, taught as Pastor the Word of God; when suddenly the soldiers rushed in and dragged me from the chair. The Faithful offered their necks to the sword, but as soon as the Pastor saw the ones who wished to rob him of the palm of martyrdom, he was the first to offer himself and his own head, not tolerating that the pagan frenzy should harm the others. Christ, who gives recompense, made manifest the Pastor’s merit, preserving unharmed his flock”. This inscription can be seen today. Pope St. Sixtus II validates the willingness to be martyred in our early church, to ensure the faith would continue. The faith would grow afterwards, not be stifled. Many of his faithful offered to take his place to be beheaded, but he would not hear of it. He literally gave his head in martyrdom so that his flock would not be harmed. And so it was, he and six deacons were murdered, and they left his flock alone. He, leading the way, then his deacons, literally laying their lives down out of love for those they served. How many of us today, nearly 1700 years later, would be willing to do the same for our faith?